The proud achievement was once again achieved by the students of Bogor Agricultural University (IPB). 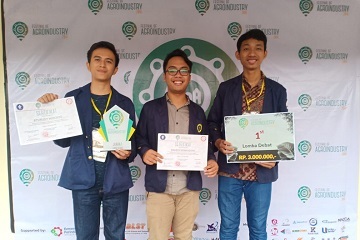 The team consisting of Sandi Fantea (Department of Mechanical Engineering and Biosystems), Atsirudi Wibowo (Department of Agricultural Industrial Technology), and Randi Firmansyah (Department of Communication and Community Development) successfully won the National Student Level Agroindustry Debate Competition. This National Level Agroindustry Debate Competition is one of the series of 2018 Festival of Agroindustry events organized by the Agricultural Technology Student Association (Himalogin) of IPB, at the Dramaga Campus of IPB, Bogor (13-14/10). The competition was nationwide and was attended by leading universities in Indonesia, such as Gadjah Mada University, University of Indonesia, Brawijaya University, Padjajaran University, Andalas University, and other universities in Indonesia. The debate competition which raised the theme "Agroindustry to Achieve National Prosperity" was partaken by dozens of students from various universities in Indonesia who passed the essay selection stage. In this competition, the participants are required to think critically about the problems of agro-industry and national agricultural issues that are being hotly discussed. Critical thinking and ideas and strategic solutions in the development of agro-industry are needed. Agroindustry is an agricultural product processing industry to produce goods that are useful through a processing process. Agro-industry can be a vehicle for the process of forming value-added agricultural products and can act as a liaison for production activities and marketing of agricultural products in Indonesia. Aside from being a source of state foreign exchange, the development of this agro-industry can directly expand employment that forms a source of funds and one of the spearheads of regional economic development. So that the role of youth, especially students from the perspective of agro-industry, must be considered. "This competition is very interesting and challenging. Criticizing the question of agro-industry, agricultural issues, and agricultural policy topics is interesting and in accordance with our field, especially IPB students. Usually, I take part in debate competitions in the realm of law, politics, and even economics. It's great that this competition can talk and argue about agriculture. Thank God, we won the first place by outdoing the University of Indonesia in the final round," said Sandi, one of the IPB delegates in the competition. This debate competition consists of three rounds namely the preliminary round, a quarter-final, then the final round. For them, this competition is not to win or lose but how participants provide solutions to the issues and problems of agriculture and agro-industry. According to him, agricultural problems include priorities in the direction of national policies. After going through various stages of the competition, with a challenging motion and topic of debate, finally, the IPB delegation was able to enter the grand final stage against delegates from the University of Indonesia. Finally, these three IPB students won first place in this competition. The second winner was won by the University of Indonesia.